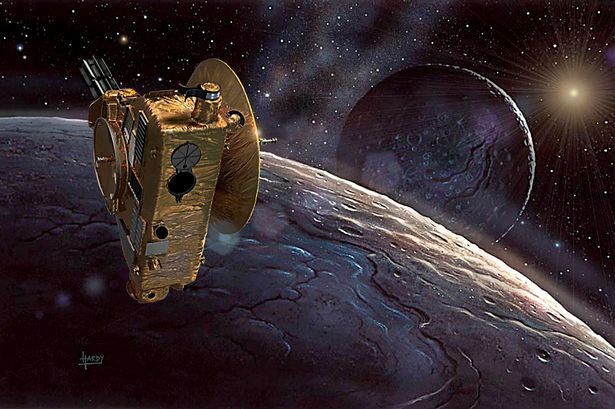 Birmingham-based artist David A Hardy has described his delight at the incredible pictures beamed back from Pluto which bear a remarkable resemblance to his own predictions created 25 years ago. A renowned astro artist has described his delight at the incredible pictures beamed back from Pluto which bear a remarkable resemblance to his own predictions created 25 years ago. Birmingham-based artist David A Hardy was inspired to guess – with a lot of research – what the then ninth planet in the Solar System looked like. Since then, Pluto’s status has been downgraded to a “dwarf planet” but the New Horizons space probe last week made a historic flypast after a 10-year journey to the extremes of our little bit of the galaxy. The images surprised scientists who expected more impact craters from asteroid collisions. They said this indicated volcanic activity reshaping the landscape. Mountain ranges also appear to be high as the Rockies. New Horizons swept within 7,700 miles of Pluto, becoming the dwarf planet’s first visitor in its 4.5 billion-year existence. Mr Hardy, who was born in Birmingham and has lived in Hall Green for 40 years, said: “For most of my life, Pluto has been the ninth planet so I wasn’t very happy when the International Astronomical Union demoted it to a ‘dwarf planet’. Back in 1990, when New Horizons was still 14 years from blasting off, Mr Hardy was working away on his vision of what one of the most enigmatic and mysterious planets really looked like. And he proved to be remarkably accurate – especially about Pluto’s moon, Charon. NASA scientists highlighted huge troughs and canyon’s on Charon’s surface – something Mr Hardy drew himself all those years ago. He explained: “Some of my predictions from the 1990s have turned out to be remarkably accurate; partly luck, but also the result of much research – this is one of the ways in which space art differs from science fiction, which uses more imagination. “I have done a number of paintings of Pluto since I did my first major book with Patrick Moore in 1972, Challenge of the Stars, and at that time we didn’t even know that Pluto had a moon, let alone five. The space probe took pictures of vast frozen plains on Pluto, which are already unofficially called Sputnik Planum after the world’s first man-made satellite. Pluto’s plains span hundreds of miles and are located in the prominent, bright, heart-shaped area of Pluto. Scientists speculate internal heating – perhaps from icy volcanoes or geysers – might still be shaping these crater-free regions. New Horizons’ science team said the data would allow them to produce elevation maps of both Pluto and its big moon Charon. It will take 16 months to transmit all the data collected during the close encounter back to Earth.